I knew seaming my puff sleeves was going to be a challenge because the sleeve cap didn’t match the shape of the armscye. It had to be eased in. I find doing that to be a little obnoxious with sewing cloth and it sounded down right difficult with knits. To make the process easier I decided to break my sleeve up into different sections and used four seams instead of two. I marked off the different sections of my sleeve using paper clips. The first seam went from the bottom edge to the purple markers to make the sleeve into a tube. That seam marked the bottom center. 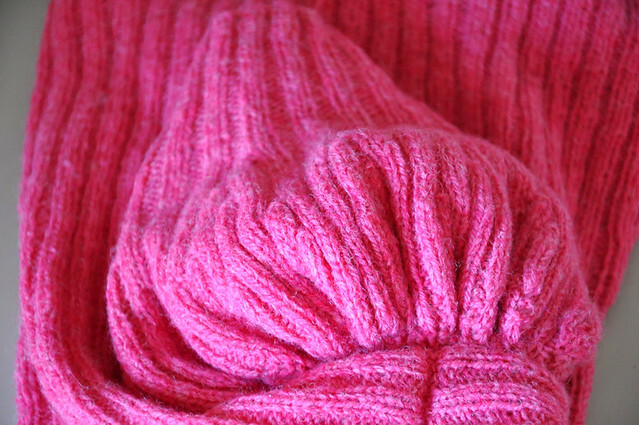 I lined that up with the bottom center of my armhole and made two seams up from the center to the green markers. That got me through seaming the shaped part of the sleeve. I ran a piece of yarn through the top of the sleeve and used that to gather the cap until it fit the remaining length of the armscye. 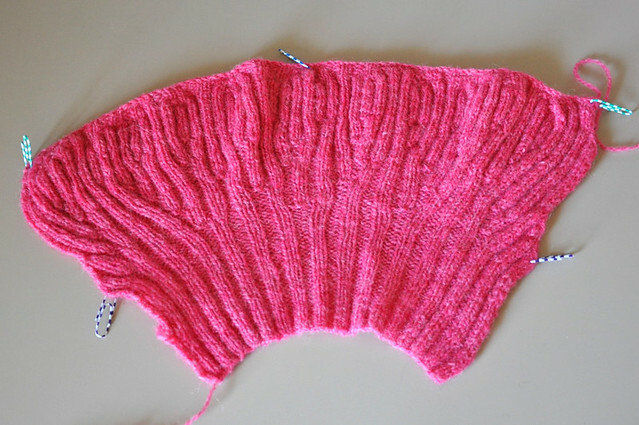 I used the blue center marker to line up the center top of my sleeve with the center top of my armhole. Attempting to keep my gathers even, I awkwardly sewed the thing down. It doesn’t look too bad! I think breaking the seaming up into sections really helped. Now I just need to weave in all of the ends. That is by far the example of sleeve seaming I have seen in a while. What I would give for your superior seaming skills! Wow! Your technique is phenomenal. I break out in a flush every time I attempt a sleeve setting. I will certainly be using your formula next time. That looks excellent. 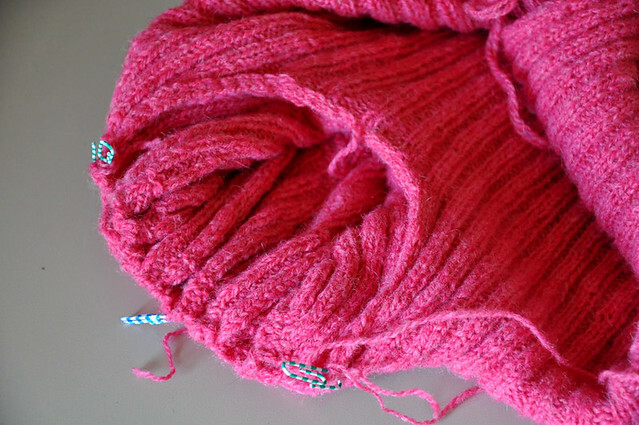 Using an extra bit of yarn to gather the sleeve is a great idea! sometimes, i wonder if you may actually be a genius. so far, yep. Oh that color is so fun!! I actually love setting in sleeves. Well, the type you sew with fabric. When I took costuming, my prof pretty much left me to sew in all the puff sleeves. Very creative approach to seaming this type of sleeve. Unconventional I think, but should work well. I have to say, not only is the finished product STUNNING (so want the pattern for the whole thing) but you’ve helped me out with the dilema about my store bought plastic stitch markers, they kept spreading the stiches … I saw the paperclips you use – GENIUS!!! I absolutely adore puff sleeves; they give an immediate 1940s vibe! What pattern is this from if I may ask? It’s Such Flattering Puff Sleeves from A Stitch and Time, and it is a pattern from the 40s. Blogging has changed so much over the years! At the time, I never imagined that readers might see this post without the context of my previous posts.